Recent epidemics and fear of epidemics have increased the importance of passive surveillance of fever and symptoms at a population level. The Kinsa Smart Thermometer combines an interactive app and a US Food and Drug Administration–approved digital thermometer that connects to a user's mobile device. Together, the hardware and software measure the user's temperature as well as collect attendant symptoms. Data are uploaded to the cloud, and via geocoding, users will be able see what other symptoms and fevers are present in their local area. Widespread uptake of such a technology would not only give individuals access to local data but, at a population level, could provide a way of tracking, predicting, and potentially preventing the spread of contagious illnesses, thereby mitigating epidemics. The purpose of this study was to describe usage and trends in fever and symptoms based on early data from Kinsa thermometer usage nationally. This is a descriptive study intended as a proof of concept. Two thousand nine hundred eighty thermometers have been used at least once since September 2014. The average thermometer has been used approximately 7 times and 50% of these users also recorded symptoms with the app. Notably, there was a discernible spike in usage in the Dallas, Texas, area after the first patient was diagnosed with Ebola on September 30, 2014. Between September 1 and September 27, 2014, there were 5.6 readings per user and between November 1 and November 28, 2014, there were 10.6 readings per user (P < .01). Data on overall usage by month and symptoms reported are summarized in Figure 1 and Figure 2. “Smart” thermometers have the potential to passively gather signs and symptoms of infection at a population level. Initial data suggest ecological sensitivity to contagion concerns. These data could help predict and prevent epidemics; however, greater market penetration will be needed to assess their utility. Corresponding Author: Dimitri A. Christakis, MD, MPH, Seattle Children's Hospital Research Institute, Center for Child Health, Behavior, and Development, 1100 Olive Way, Ste 500, Mailstop 8-1, Seattle, WA 98101 (dachris@uw.edu). 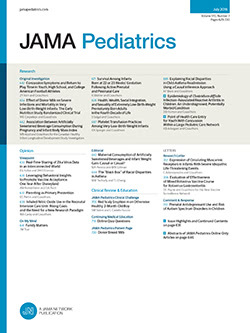 Published Online: September 8, 2015. doi:10.1001/jamapediatrics.2015.1162. Disclaimer: Dr Christakis is an Associate Editor of JAMA Pediatrics but was not involved in the editorial review or the decision to accept the manuscript for publication.